Santa Pod Raceway's legendary Barn entertained its last visitors at the 2007 FIA Main Event after SPR were ordered to remove it by Bedfordshire County Council Health and Safety. Eurodragster.com readers have sent their tributes to the Barn. The most recently-received tributes are at the top of the page. 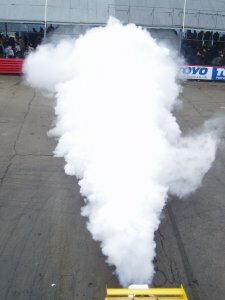 To send your own tribute to the Barn, E-Mail eurodragster.com@btinternet.com. I used to take public transport to Santa Pod in the 1970s. Upon arriving at Wellingbourgh station one night, I realised I had forgotten the poles for my tent. D'oh! Too knackered and too late upon my arrival at the Pod to sort it out, I spent the night in the the Barn in my sleeping bag. She was my tent for the night, so thank you Barn for keeping me dry that night. The whole meet was a rain-out, I can remember Stripteaser making a run before the heavens opened. Ah, they were the days, but I still love it...goodbye Barn, such a shame! I first went drag racing in 2003 and was wandering round the pits for most of the afternoon until Cordette Pateman suggested standing in the Barn. I will never regret the decision to listen to her as it kick started my absolute love for the sport. The noise, smells, forces and chest-flattening shock that comes with the barn cannot be beaten. Where are we to take the Drag Racing newbies to be broken in by Martin Hill? Like the vast majority of people who love drag racing, I too will be sad to see the demise of the Barn, so synonymous with SPR over the years. The Barn holds special memories for me, in 1970 along with my racing partners at the time Derek Chinn and Mike Butler, we took a week's holiday from our normal occupations to help (!) Bob and Roy Phelps with any work that needed doing around the Pod - and there was plenty! After screwing up most the jobs we were allocated, Bob hit on the foolproof (almost!) idea we should undertake some painting, consequently we spent four days in soaring summer temperatures getting very intimate with the legendary Barn. Maybe Ray White (below) is correct when he says this could be the start of a new era, I for one certainly hope so - otherwise all that effort would have been wasted. What can I say. Its the end of an era for UK drag racing and in fact for Europe as well. I have been going to the Pod for over seventeen years and it has taken over my whole life. I sleep, eat and watch drag racing and book my holidays around the Pod. It is like one big family and the barn is part of my family. From stood watching the racing to sitting in the Barn after a hot day and looking down the track dreaming about the next day and what we where going to see and thinking back to that day's racing, I will miss The Barn. 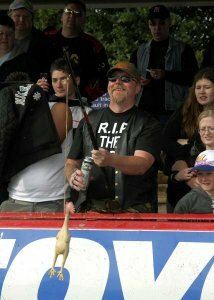 After years I came up with the joke of standing behind the Jet cars (too much beer when camping) and that was when Charlie Chicken was born and I became known as Rubber Chicken Man, and what a laugh that was. So here we are, and what a sad day it is. So at the next race I will raise a case of beer to The Barn. RIP. What can you say about our Barn. It's very sad to see the demise of the barn but, it had to come eventually. I am surprised it has lasted so long with our sometimes crazy Health and Safety laws that have allowed it to remain standing for as long as it has. I remember Bob Phelps building the barn well over thirty years ago. Along with the Tower, which Bob also built, the Barn has served us all very well. It's stood up to everything that we could throw at it, Jet cars, Fuel cars, flame burnouts, Rocket cars and remained solid throughout, a testament to its builder and designer. It provided spectators with a view and an experience of drag racing you could not get at any other drag strip in the world. The Barn will remain in the thoughts and photographs of many people and magazines forever, so will never be forgotten, it's part of the history of Santa Pod Raceway. Keith Bartlett and crew are committed to making Santa Pod Raceway one of the best Drag Racing facilities in the world, time has to move on, things must change and be updated. Ian Messenger laid down a disputed 165 mph on the Vincent-powered Pegasus and both he and Dennis Norman became the first British drag racers to compete in the USA when they entered the Nationals at Indy. RIP. Where is everyone going to shelter from the rain now. We can't all get in the beer marquee. My first outing to the Pod was in 1977. As we walked round to the pits we walked through the Barn and that was my first view of drag racing and it blew me away standing looking up the famous 1320, dreaming like we all do that one day. Now the one day is here and since stepping up to Pro Mod with oil leaks and parts flying off the car I seem to spend more time looking from that same angle but on the other side of the armco. You see the same diehard Barn nutters all smelling of jet fuel giving you the thumbs up and the odd round of applause. But at the end of the day we are ment to be the number one track in Europe so a rusty cow shed at the beginging of the track may not be the best thing for the sponsors to look at. Getting rid of the barn could be our new start, tower next, let's start getting Stateside, let's look to the future and towards putting the Pod on a par with the USA. We will all miss the Barn, a bit of our history, but time to move on. RIP the Barn. I first went to Santa Pod as a spectator in Easter 1973 and later as a racer, but one thing I loved watching from the Barn were the flame burnouts. This was definatly the place to watch the likes of Bootsie and Dennis Priddle do flame burnouts in the old slingshots, and afterwards to run outside and see all the globs of flaming rubber up on the roof. The Barn was the first place I ever stood to see the "Big Dragsters" as my dad used to call them back in the early 1970s. That's when cars like Firefly would burn out only a few feet from the fence in front of the barn . Talking of Firefly, that was a car to see going down the track! That's a sight that will stay with me forever. My own Barn memories are too many to list, but for the sake of posterity I wanted to stick my own tuppence-worth in. Three in particular stand out. Firstly, from a race last year. The long rain delay had allowed John Price to chat to some of our past greats, Dennis Priddle, Peter Crane and Roz Prior I think to name just three, and I was thinking how much of a shame it was that they probably wouldn't see any action. I suspect most of the fans were thinking the same, but miraculously thanks to the extraordinary efforts of the track team we managed to get underway around 3:00 pm, and I can still vividly remember the cheers and sense of anticipation as the first Fuellers launched. Another, much earlier, memory dates back to the early eighties. Don Prudhomme had come over with the legendary Army Plymouth Arrow Funny Car and I think every other Funny Car in Europe had assembled to have a crack at him. As I looked from The Barn down the old fire-up road I could see around twenty cars, stretching from the start line right the way back to the Pits. Possibly at the same event, or if not certainly only a year or two before or after, there was a burnout competition with, I think, two hundred pounds up for the winner. Of course, the fans had to choose the winner by cheering appropriately loudly. Sylvia Hauser filled (and I mean completely filled) The Barn with burnout smoke from her Dodge. When the smoke had cleared, literally and figuratively, all our clothes and hair were covered in thousands of tiny balls of molten rubber. Priceless. It is a great shame that it has to go, but memories stay with us all forever. Keith and the team are trying very hard to bring the facility up to standard, and regrettably The Barn looks a little out of place in our new FIA world. The Barn has been central to my experiences of Top Fuel. Our very first visit to Santa Pod as a family was about five years ago when we came to SPR almost on a whim, just to see what the sport was about. Within ten minutes of being at the track, I was in the Barn with Hannah, watching qualifying for Top Fuel. The sights and sounds were astonishing, and being so close behind the cars was addictive. Then to watch Andy and Barry Sheavills do the first 300 mph side by side was enough to seal my fate as a Top Fuel junkie. It was only two years later that I was there watching the Wildside team as part of the crew; the Barn was my spot to watch. Without doubt my best memory was being there to see Darryl win against Kim Reymond when we thought we had no chance. The time was nothing special, but the race certainly was. Since then it has been where I choose to watch; better than the start line. The atmosphere, the crush of people was special. I now watch Andy Carter and the adrenaline is still the same, but not being able to be in the barn will take something away. It was fantastic while it lasted. The Barn- the best place to get an adrenalin rush standing still, feel the noise, smell the rubber and taste the fumes. I love it!